Happy almost-Friday! How’s your week been? Around here, it’s been kind of quiet and rainy, which has been the perfect vibe for reading, making soup, and taking long, super-steamy baths. Nope, not for running! Haha. Some of you can run in the rain. I respect that. I’d like to run in a tropical rain. But San Francisco rain is cold and bitter! Nah, I’ll stick it out with yoga, the elliptical, and swimming until things clear up again. Well, as always, there were some good finds around the web this week. Here you go ~ enjoy! Pink is just wishful thinking has GOT to be my favorite quote of the year so far. I’ve always had a theory that pink is subversive and now I know why. What an interesting argument! In their words… whether or not certain cetaceans—primarily whales and dolphins—deserve to have legal rights under the law, the same as people have. Yowza! I’m telling you. We must prepare. They WILL become our overlords… once again. 3. Need a crash course in Mad Men Season 4 before Sunday’s Season 5 premiere? Click the link above for a comprehensive, 4-minute video that reviews all the good parts. Trés Sugar helped us out here. Thanks, Trés! 4. 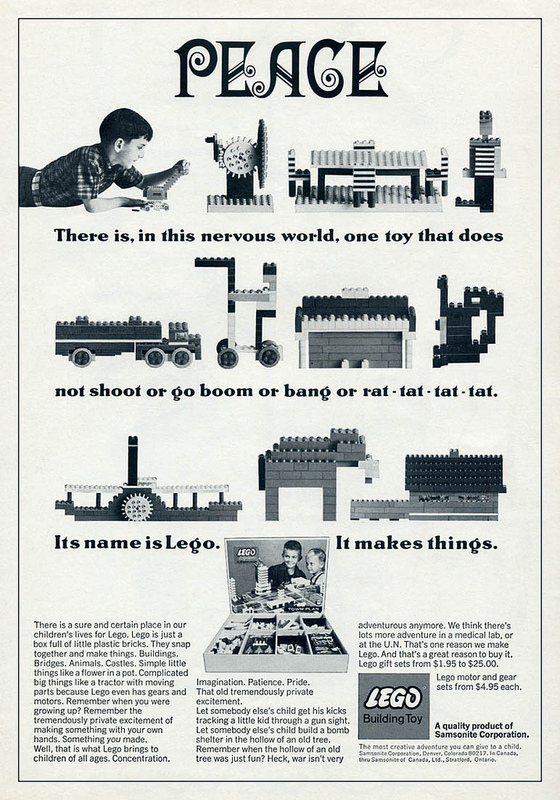 Via Copyranter, this fantastic 1960s anti-war Lego ad. Try not to cry. 5. Rawmazing had some deee-lish-looking Strawberry Thumbprint Cookies! No, I haven’t tried these yet, but I’m gonna! AND I want to try them with cashews instead of almonds. HOW great would that be? Super-great. It’s not about the gluten-free pizzas or the vegan cookies or the dairy-free ice creams. Yes, I’m sure they all taste great. But if these companies are taking out the gluten, dairy, fat or sodium, well … what exactly are they putting in? Kind of scary to think about, isn’t it? Just take a look at the ingredient list, and I’m sure you’ll be blown away (or unable to pronounce) what’s inside. Let’s start by taking a step back and eating the basics: fresh produce, lean proteins and healthy fats. Challenge yourself to forego the food store for local farmers markets … I bet you’ll be surprised how creative you can get. And the best part? Your taste buds will transform, and you’ll soon realize you don’t need that fake sweetener or that sugary iced tea or those cookies. Plus, she includes a few delicious recipes for Vegan Falafel Balls and Kale Cashew Pesto. Yum! Save money, customize, reduce waste, and know exactly what your skin is absorbing ~ yes! Excellent reasons. Check out her post for some thoughts that will get you on the DIY train in no time! It’s true. We don’t need much for a meaningful life. We really, really don’t. 9. Hey, romance writers! Read RT Review’s 10 places now accepting manuscripts! Got a finished ms? Send it out! Set it free! Good luck! 10. Finally, Mashable shared a new HowAboutWe, this time for couples. Been with your honey for a while and need some fresh ideas for dates and quality time? This sounds like a good, cute idea. Whelp, that’s all for now, friends! Have a wonderful weekend! Hi Andrea! I am right there with you as I am not a rainy day runner either. Sometimes, when there is a drizzle, you can catch me running in the canyon as the canopy of trees offer me some reprieve from the rain. I usually stick to my cross fit training and boot camp classes during the winter months though. I am definitely going to check out Amie’s site on clean eating. Sounds right up my alley. I wanted tp let you know that I posted an amazing kale salad that is super easy to make and tastes fab! BTW, I want more of your book as I was pulled in right away with your first chapter. I love it as I love the whole sci-fi and fantasy genre. How far along are you on it? I will totally buy a copy when you finish it. I am currently reading 11-22-63 right now by Stephen King and it’s pretty good if you looking for a book. It’s not his typical horror and more about time travel. Enjoy this reprieve from the rain today. Hi, Jackie! Thanks so much for stopping by and leaving a comment! I haven’t been able to comment on ANY Blogspot blogs in the last few weeks and it’s awful ~ the page just refreshes over and over 😦 I don’t know if it’s a glitch with Blogger or what, but I did a little research and it seems to be a common and known issue. Stinks! I’m still happy you stopped by! Thanks SO much for your sweet comment about my writing and for the book tip! I’m working on that story as a brand-new one, so it’ll probably take a while 🙂 But I’ll definitely let the world know when it’s ready for ya! I love your kale salad and will definitely try it. I’m pretty sure we can’t get enough kale these days. It’s so yummy and SO crazy-healthy and in total abundance right now. You are lucky you have a canyon to run in. I’ve said before I wouldn’t mind running in the (cold) rain if it weren’t for the traffic and crazy drivers around here. Maybe I just need to drive to Pacifica or Marin and do it there! 🙂 Have a great day!! This weekend is gonna be pretty chilled. My week has been full on and I just want to relax. But I’ll throw in a few good gym sessions first! Ahh ~ thanks so much for thinking of me! And yuck, eew, bleah! That’s so gross. The more I read and learn, the more dedicated I am to making my own natural stuff. Have a nice, chill weekend! I’m off to the gym, myself. Work it!